WITH YOUR FAVOURITE pair your leather jacket with stripes , T-shirt or striped shirt they always look great under a leather jacket. 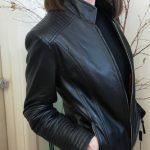 CREATING YOUR LOOK this leather Jacket Marta 11, has a longer line slim fit for the cooler weather, zips up to the neck with a short mandarine collar, two side pockets and details on the shoulder and sleeves gives a classic leather jacket a modern style for all seasons. Black on Black has never looked better, minimal effort and stylish.